A Roman cemetery has been unearthed on the site of a housing development in North Lincolnshire. 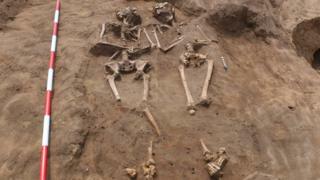 Dozens of 2,000-year-old skeletons have been found at the site near Winterton where 135 homes are being built. So far more than 60 graves have been excavated by a team of archaeologists at the 1,500 sq m (16,145 sq ft) site. Pieces of pottery and "grave goods" left for the dead have been found in the plots containing the remains of men, women and children. Natasha Powers, senior manager at Allen Archaeology, said the discovery was "not an everyday find". "We knew there was a Roman settlement but we didn't know about the cemetery," she added. "It tells us something about the population living there 2,000 years ago." The town is near the Roman Ermine Street which ran between York and Lincoln. A number of other artefacts have been unearthed, including a 2nd Century Roman villa with a mosaic floor. Excavations are continuing and the findings will be put on display in a local museum.